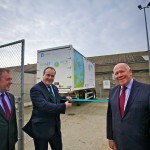 The pioneering Surf ‘n’ Turf hydrogen community energy project has been launched in Orkney by the Scottish Government’s Business, Innovation & Energy Minister, Paul Wheelhouse. Mr Wheelhouse, one of 70 guests travelling from as far as Malta and Spain, officially unveiled the newly installed hydrogen fuel cell at Kirkwall Pier on Wednesday 27th September 2017. 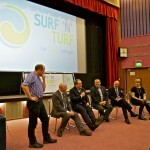 Surf ‘n’ Turf is led by nationwide charity Community Energy Scotland, working with project partners EMEC (the European Marine Energy Centre), Orkney Islands Council, Eday Renewable Energy, and ITM Power. 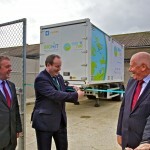 The fuel cell is the final aspect of the hydrogen generation system being developed in Orkney as part of the Surf ’n’ Turf project: a pilot project looking to circumvent local grid constraints by generating hydrogen from tidal and wind energy. Other elements of the system include an electrolyser which has been installed at EMEC’s tidal test site on the island of Eday. It produced the world’s first tidal-powered hydrogen in August this year. 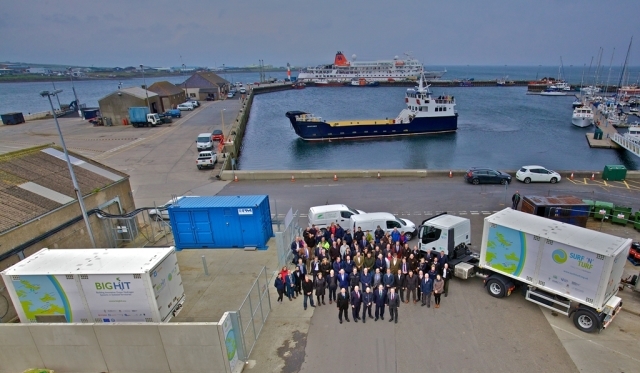 Once produced, hydrogen will be stored and transported to Kirkwall where the fuel cell will convert it back into electricity for use by the inter-island ferries whilst berthed at the pier. 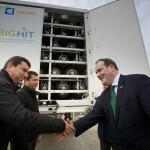 As it is produced from renewable electricity, Surf ‘n’ Turf’s hydrogen is a clean fuel that causes no carbon emissions, and has many potential uses – including to supply electricity, as a transport fuel for vehicles or ships, for heating, or to make fertiliser. A key aspect of the Surf ‘n’ Turf project is the development of educational facilities, run by Orkney College UHI, to skill up the local community in hydrogen handling and attract trainees from other countries. 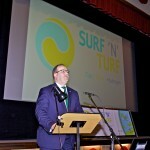 The Surf ’n’ Turf project has received £1.3m of Scottish Government funding through the CARES programme and Local Energy Challenge Fund. “I enjoyed what was a fascinating visit to the Surf n’ Turf facilities at Kirkwall Harbour to see how the project in developing, utilising electricity from Eday, and to discuss its potential to go even further, through the BIG HIT project, in further establishing and growing Orkney’s hydrogen economy. “Hydrogen itself and hydrogen fuel cells both have huge potential in Scotland’s low-carbon energy system and we have already supported a number of world-leading hydrogen demonstration projects. “We will continue to support innovation in suitable hydrogen initiatives and explore the practicalities of using hydrogen as a zero carbon substitute fuel for the heating of homes and businesses in Scotland and in transport. 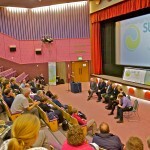 Following the unveiling of the fuel cell, a public seminar on ‘Orkney’s Hydrogen Future’ was held at the Pickaquoy Centre with a turnout of over 100 people looking to find out more about the developments taking place in Orkney around hydrogen. “We never forget why we took on this challenge: we want community energy to work so that local people benefit directly from their renewable energy. “This is all about turning a problem into an opportunity – a home-grown solution to the difficulties grid restraints cause for a community with abundant renewable energy resources.